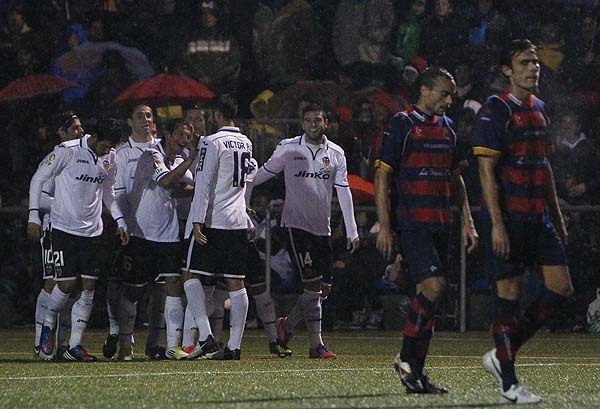 Valencia CF won in the first match against Llagostera in the Copa Del Rey with goals from Jonas and Haedo Valdez for a win of 2-0. In the match youth player Gaya had his first debut for Valencia CF and he played the full 90 minutes of the match. The first goal came through Jonas in the dying stages of the first half as he managed to get to the ball after a free kick by Daniel Parejo. In the second half Valencia CF would seal the match with a goal by Nelson Haedo Valdez in the 70th minute. Llagostera would have a chance for a comeback after Barragan made a foul in the penalty area, but Sallares missed and only managed to hit the post. UE Llagostera (0): Moragón, Aimar, Vallho, Canal, Enric Pi, Tito, Alex Moreno (Serramitja, min. 61), Artabe (Masó, min. 69), Sellarés, Pitu (Joaqui, min. 61) y Tarradellas. Valencia CF (2): Guaita, Barragán, Ricardo Costa, Víctor Ruiz, Gayà; Feghouli(Cissokho, min. 68), Ever, Dani Parejo, Guardado (Viera, min. 85), Jonas(Albelda, min. 74), Valdez. Goals: 0-1 Min. 46 Jonas 0-2 Min. 68 Valdez.